I’ve been wanting to put you in time-out for a while, but your Unicorn Frappuccino put me over the edge. Why was I already annoyed with you? My name is Dani—not the Dane, Daniel, Annie, or Bob you write on my cup. Your drinks are overpriced, and you are slow. In the time it takes you to pour a hot coffee, I could harvest coffee beans, roast them, and make a coffee over a campfire. 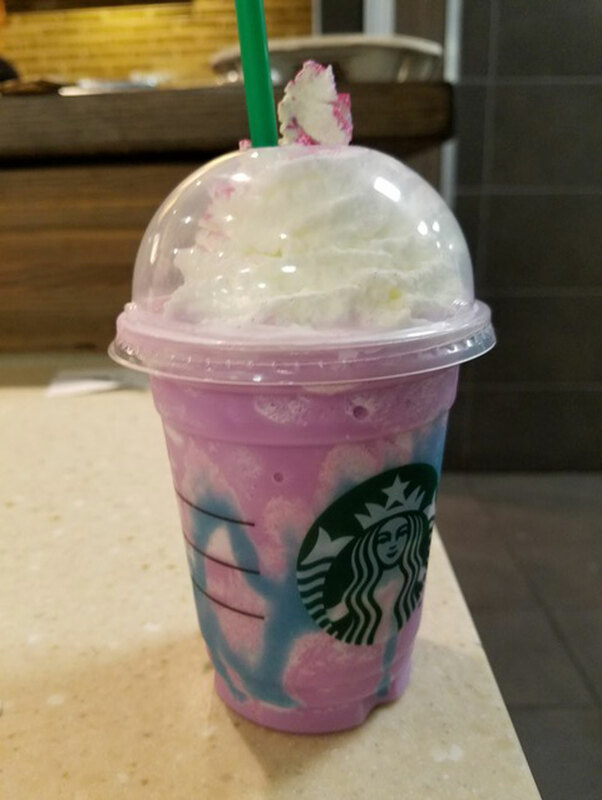 Now you roll out the Unicorn Frappuccino, a nutritional abomination that features 500 calories, 76 grams of sugar (that’s 15 teaspoons), and 18 grams of fat. Because you’ve named it after a magical unicorn, kids are as obsessed with it as they are with Pokémon GO, except Pokémon GO is free and encourages physical exercise. Your drink is a $5 cup of diabetes, a down payment on obesity. It’s 2017 and we’re all supposed to be “body positive,” but that doesn’t let you off the hook. Obesity is a nationwide epidemic and rates of Type 2 diabetes in children are skyrocketing. Poor nutrition can have a negative impact on how people feel and function, both physically and mentally. Solo Moms try to help their kids eat healthy foods and eat reasonably sized portions. We wouldn’t give our kids 16 Oreo cookies or seven Krispy Kreme doughnuts. Our kids wouldn’t even ask for that. But, because your drink is colorful, glittery, and named after a unicorn, our kids are demanding it. If Dante were still around, it would become his 10th level of purgatory. Solo Moms with limited time spend an insane amount of time waiting, waiting, waiting, waiting for baristas to make the drink (even they don’t like it, by the way). Then there’s the indignity of having our name spelled incorrectly on the cup while we fork over enough money to buy a week’s worth of beans, brown rice, and leafy greens, and feeling like a parental failure while our little ones guzzle down the drink. Unicorn-themed food doesn’t have to be unhealthy. A café in Brooklyn unveiled a healthy unicorn latte well before you rolled out yours. The New York Times ran the recipe in December, and it most certainly does not contain 76 grams of sugar. Or, you could have offered some healthful unicorn snacks like this unicorn toast. Starbucks, it’s time to welcome yourself to 2017. We are in a post–Super Size Me era. There are ways to profit from the unicorn craze without selling a nutritionally harmful concoction. Danielle Bostick, a former Solo Mom and ESME’s Wellness–Mental Health Resource Guide, is a Latin teacher, an advocate, and a mom to six kids in Winchester, Virginia. When not working as an educator, Bostick writes about the National Football League for various sites and sexual assault and child sexual abuse for the Huffington Post. You can find her on Twitter: @danibostick, and on Facebook: Dani Bostick.